Family violence is a serious issue in Australia that crosses all demographic boundaries. Between July 2014 and June 2015, 70,902 incidents of family violence were reported in Victoria. In Boroondara alone, over 800 reports were made to police in the last financial year. Yet we know that the real figures are likely to be much higher due to the barriers that stop many people reporting abuse, including fear, financial stress and stigma. These statistics are not only shocking, they are unacceptable. Today I was pleased to host the City of Boroondara’s White Ribbon Day event in support of its campaign to end family violence. We heard from 2015 Tasmanian Telstra Businesswoman of the Year Beth Mathison, who shared her experience of family violence. Beth’s talk was moving and illustrated yet again that anyone can find themselves a victim - family violence knows no boundaries. Following Beth’s talk, representatives from local services - Eastern Community Legal Centre, Eastern Domestic Violence Service and Victoria Police - participated in a forum and provided invaluable information on the support available for members of our community who are affected by family violence. I commend the Boroondara Family Violence Network for its excellent work supporting people who have been impacted by family violence and facilitating local violence prevention efforts. If you would like to learn more about the role we can all play in preventing family violence, the work of White Ribbon, and the support services available, I encourage you to visit White Ribbon’s website. image above: L-R Cr. 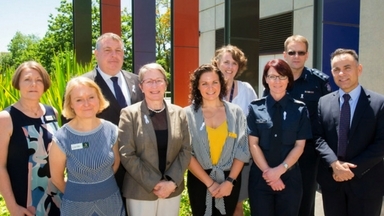 Lisa Hollingsworth; Cr Jane Addis; Mayor Jim Parke; keynote speaker Beth Mathison; Marika Manioudakis, ECLC; Gina Kennard, EDVOS; Fiona Calkin, Victoria Police; Stephen Noy, Victoria Police; and John Pesutto MP, Member for Hawthorn at our 2017 White Ribbon Day event.